A re-imaging of a symmetrical Black Ops 2 map, Hydro. Separated by a dynamic water effect in the middle of the map, this remaster stays true to its roots. 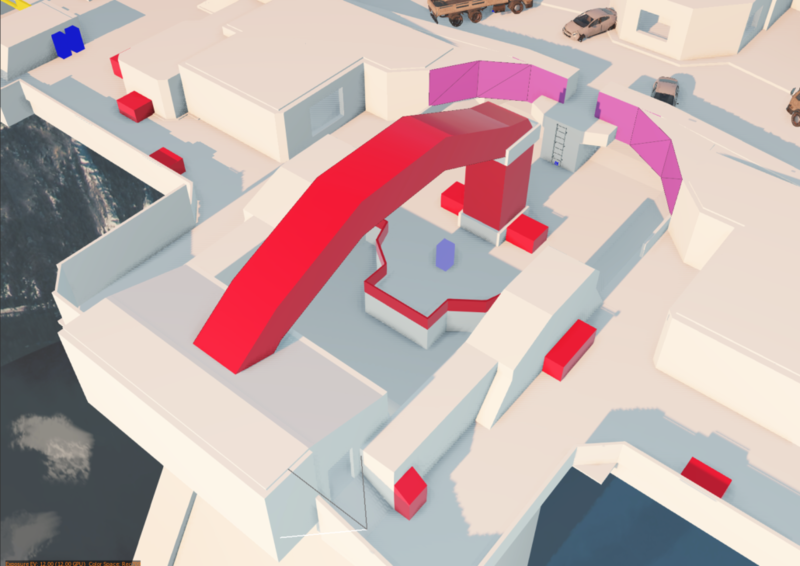 With new areas to explore while keeping its fiction, Hydro Remastered supports advanced movement mechanics while keeping the flow of the level the same. This is my first attempt to “design” a multiplayer map, so I thought that starting with a solid base (the hydro map), looking at its lanes and flow, would help me when creating the new areas and flanking routes. The knowledge learned from making this will motivate and fuel my next map that I make from scratch. Every multiplayer map should flow well. 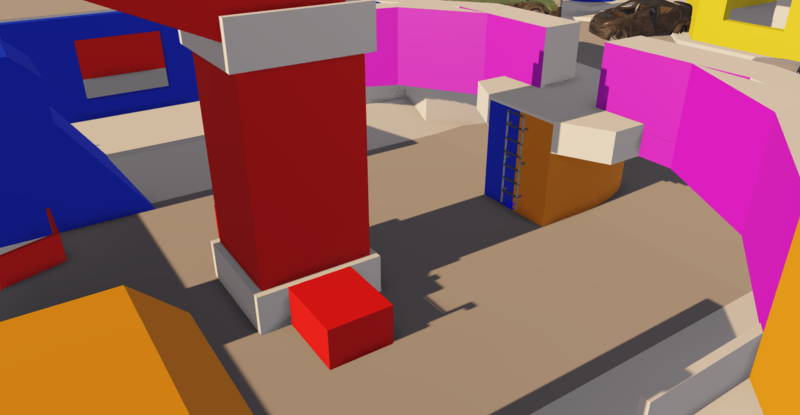 This means that the lanes and architecture of the map should tell the player where to go and have it be fun and exciting for them to traverse. There should be little to no dead ends, no areas where you can turn the corner and get killed by a camper, etc. For the most part, I achieved that as well as I could within the 5 days I worked on the level. 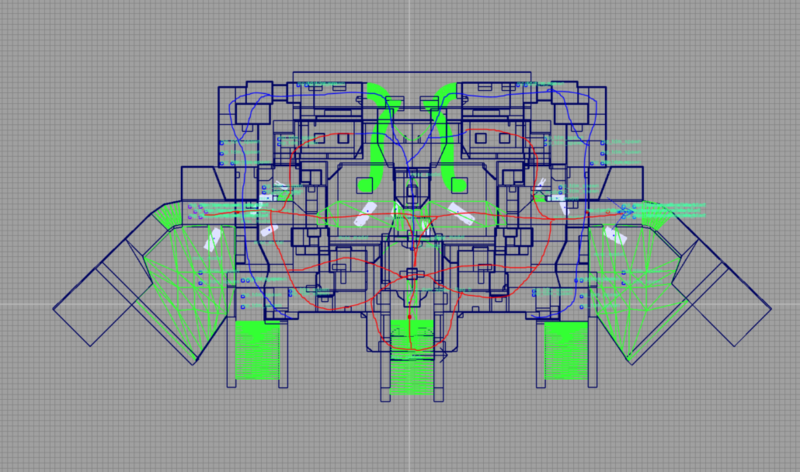 The original level was symmetrical, so I decided to keep it that way for the parts I made, but to make sure that no matter what side you are on, you know where you are. Adding colors to each side (blue and orange), as mentioned to me from some professionals, allowed for this to happen. I made sure to keep sharp corners to a minimum and for most rooms to be flanked so that a player cannot sit there and win the game with a shotgun. I did this by making sure each room had at least 2 entrances so that players could not camp the one entrance and rack up kills and cause frustration. The first area that I thought was pretty bland in the original map was where the bottom lanes met. It was quite open except for the underground tunnel part. That area provided cover for killstreaks, but was cramped in terms of the areas that connected to it. 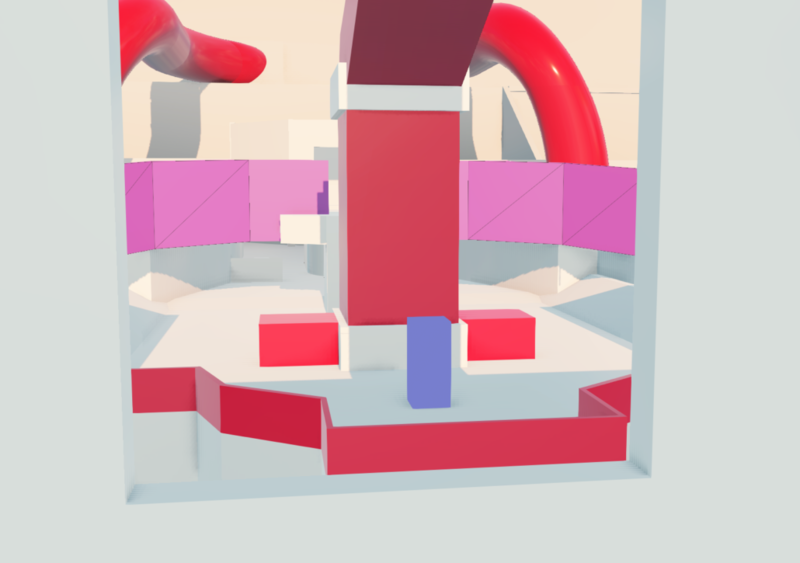 I wanted an additional route in this area because where numbers 1 and 3 are, were blocked off on the bottom and if two players were fighting each other in this area, it was all about head glitching and that is not fun combat. 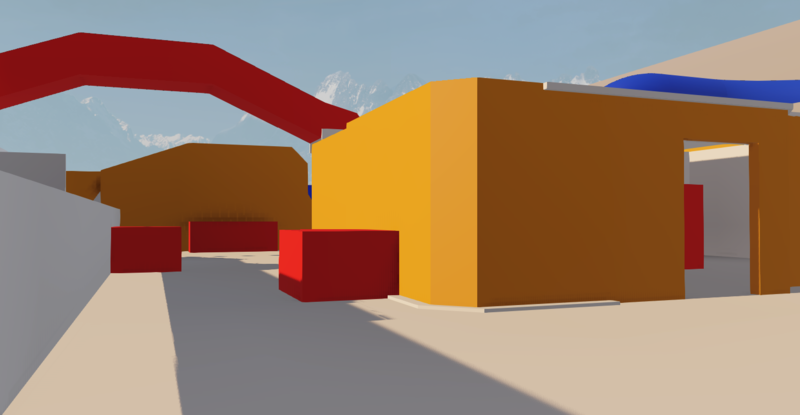 By adding the additional lane (and the small building), I not only removed that frustration, but added cover from kill streaks that you’d get from going around the opposite side. Spot to jump down from the center lane, quite dangerous as there is little cover, but you can wall-run on the purple wall to get to cover on the sides. Most of the original middle lane has stayed the same. After completing the blockout of the original map, I left all of the cover out and did not go back to the map to check what they had put. 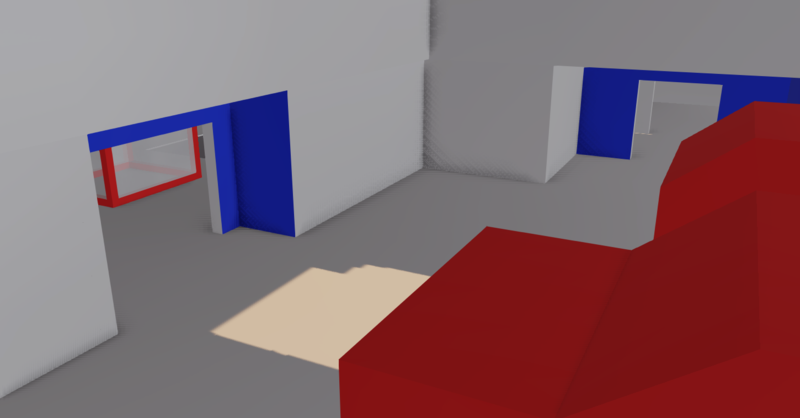 I wanted to challenge myself and figure things out based on my eye, playtesting and iterating. The bridge cover from the original map has been flipped. Before, the building on the left partially blocked the long line of sight. Instead of that, I wanted to reverse it and foster long range sniper combat. Why? First, the bridge had multiple entrances so camping was not an issue. 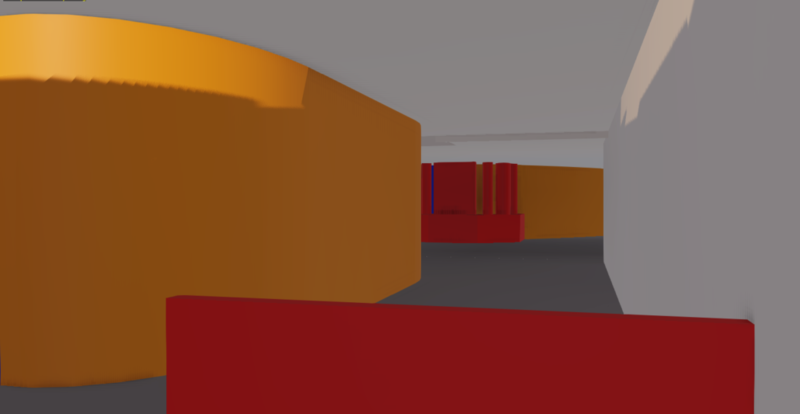 Second, the large amount of cover in the middle lane street allows players to tactically maneuver through the lane without being sniped. Although I liked this design, it’s far from perfect. The middle lane went through the least amount of iteration so it can definitely be improved. Much like the bottom lane of this map, the top lane was a head glitch fest right in the underground area as the circular vent and the cover before the terrain went down provoked that kind of gameplay. 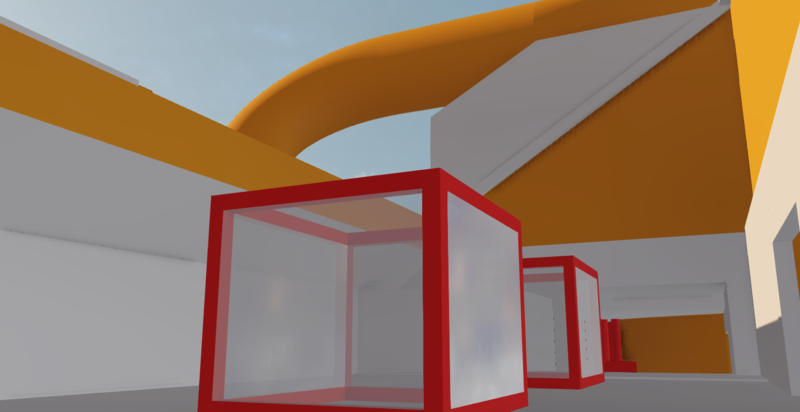 The room with the glass boxes promotes smg/cqc gameplay, while the top are in the first image promotes assault rifle gameplay with the slightly longer line of sight and open middle area. The room with the window provided a nice sniper spot, but has 2 entrances as to not be a camping spot. I feel that these two additions of the level not only provide a new place to play in, but promoted a bit of longer range combat since the original map had tons of tight corners that really promoted smg and shotgun gameplay. A recent design term I learned about multiplayer level design is the word ‘fiction’ by watching an ex-employee of Advanced Warfare. He went into an empty match of all of the levels he made and talked about the design history and development process behind it, and one of the words that stuck was fiction as it fostered the design of the level by providing a sense of style and theme of the map. Hydro’s fiction was a dam with like a run off water route in the middle with a road that went through the dam. I obviously wanted to keep this fiction, so the areas I added would match. For the top lane, the curved 90 degree turn gave a sense of it being a large pipe or underground area that would possibly be seen at a dam. The large blockers in the top lane before that curve could act as generators and it being a generator room that powered on the fans or allowed the water event to happen. For the bottom lane, the giant red crane acts as a blocker for the head glitching spot I talked about before, but also acts as a reason for the smaller building to be there. I was thinking of that building to be a sort of “window washer” type thing that you would see on skyscrapers. I originally had it connected to the dam itself with the crane just being a giant pillar, but it looked off. I think the second iteration of that area was much better than the first as it fit the fiction better and allowed for more counter play to the tight quarters the map was.